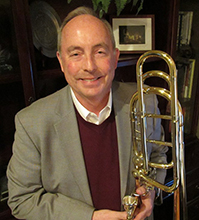 Don Greiman studied bass trombone with Mr. Thomas Swanson at Bemidji State University and taught music in the public schools before joining the 702 Strategic Air Command Band. After a 20 year hiatus from performance, he joined the Sona (Verona Italy) community band and brass ensemble. He has performed with The Wright State University Trombone Choir, is a member of the Ohio Valley British Brass Band, and plays frequently in Dayton area brass ensembles, including recent 2016 Holiday appearances at Epiphany Lutheran Church, Wittenberg University (Springfield OH), and the Austin Landing Christmas Tree Lighting Ceremony. Don serves as a member of the Ohio Valley British Brass Band Steering Committee and has performed with the band since 2007. He is also a member of The Greater Dayton Brass Ensemble.